No impact exercise can be a great way to get into shape without affecting your joints. This article will discuss the benefits and implications of exercising without impact. No impact exercise is exactly what it sounds like. Any exercise that doesn't cause jarring impact on the joints is considered an exercise with no impact. For example, a weight bearing exercise such as walking is considered low impact, a more jarring exercise such as running is considered high impact and deep water walking using a flotation belt is considered no impact. Can You Exercise if You Have a Hernia? It is important that if you have one of the above conditions, you talk with your personal health care provider before you undertake any exercise program. There are a number of exercises with no impact that you can try. Aquatic exercise is more than just swimming. There are many exercises that you can perform in a swimming pool that can limit impact. For instance, water walking uses the buoyancy of the water to remove all of the impact on your body's joints, but still allows you to exercise aerobically and strengthen your muscles. Check with your local gym or pool to learn more about aquatic exercises that are available in your area. Yoga consists of stretching exercises that can also help to strengthen and tone your muscles. Yoga confers a number of benefits including increased strength, improved stability, improved cardiovascular health and stress management. 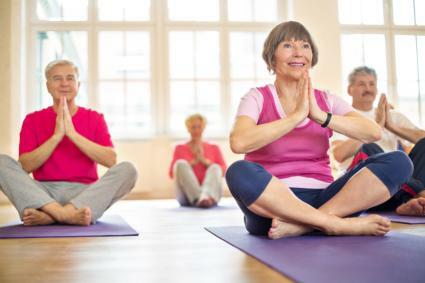 Check with your local gym or yoga studio to find a beginning yoga class that is right for your needs and goals. Seated exercises, also known as chair aerobics, was originally designed for diabetes patients who were unable to sustain traditional low impact exercise. Seated exercises can help you to exercise your entire body through a series of targeted and rhythmic exercises. These exercises can be used to improve overall fitness, cardiovascular fitness, strength and flexibility. Diabetes Forecast offers a full set of seated exercises for a full body workout. 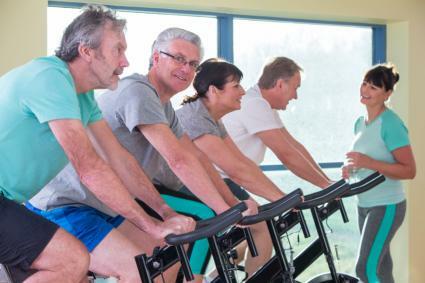 If you would like to try a more strenuous non-impact exercise, then cycling and rowing are both excellent options. Cycling can be done on any type of a bicycle or on a stationary cycle. Recumbent stationary cycles offer a gentler option for those with joint issues. Rowing machines (or rowing a boat) is a strenuous non-impact activity that provides not only a cardiovascular workout, but also allows you to work many of your body's major muscle groups as you row. Isometric exercises involves contracting and releasing your muscle groups. When the muscle group is contracted, it is held until fatigue is achieved. For instance, when bodybuilders strike a muscular pose, they are using isometric exercises. One of the best parts about isometric exercises is that you can do them anywhere. For instance, if you are sitting and watching television, you can tighten your stomach muscles and hold them until they are fatigued. This strengthens the muscles. SportsFitnessAdvisor.com offers an isometric exercise workout. Non-impact Pilates focuses on good posture and uses yoga-type exercises to strengthen and tone muscles. Many local gyms offer Pilates classes and several may be non-impact Pilates. Check with your local gym to find out if there are classes that are right for you. Exercise doesn't have to impact your joints and bones in order to be effective. If this type of exercise sounds right for you, contact your personal health care provider, and then make an appointment with a fitness professional who can show you how to exercise with little or no impact.